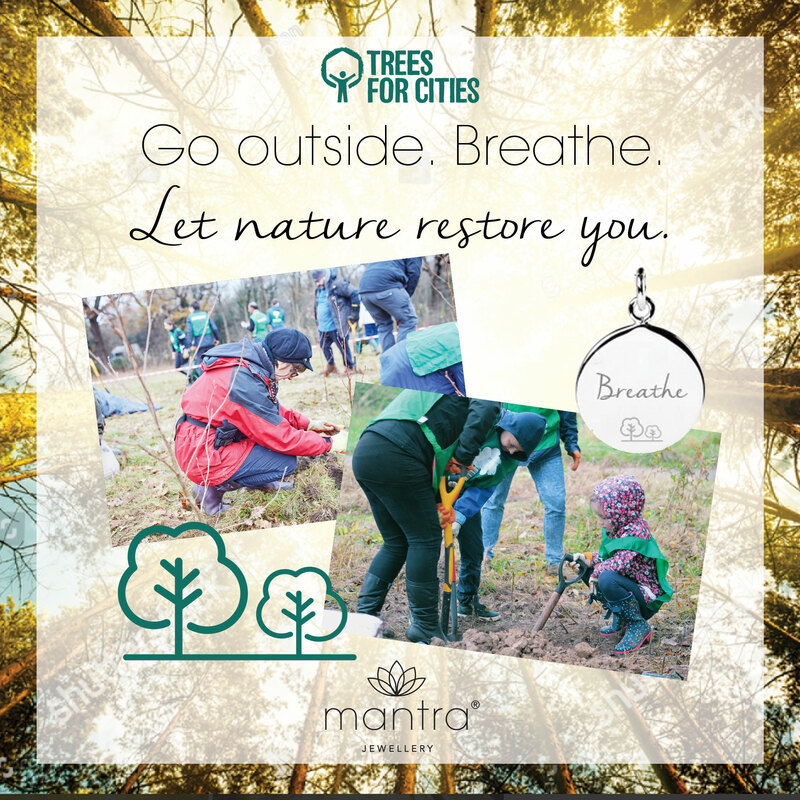 We are very excited to be able to talk about a new collaboration with a charity that is close to our hearts - Trees for Cities - on a new necklace in our ‘Mantra Changes Lives’ collection. This is our initiative to raise funds, show support, and build awareness for important causes. 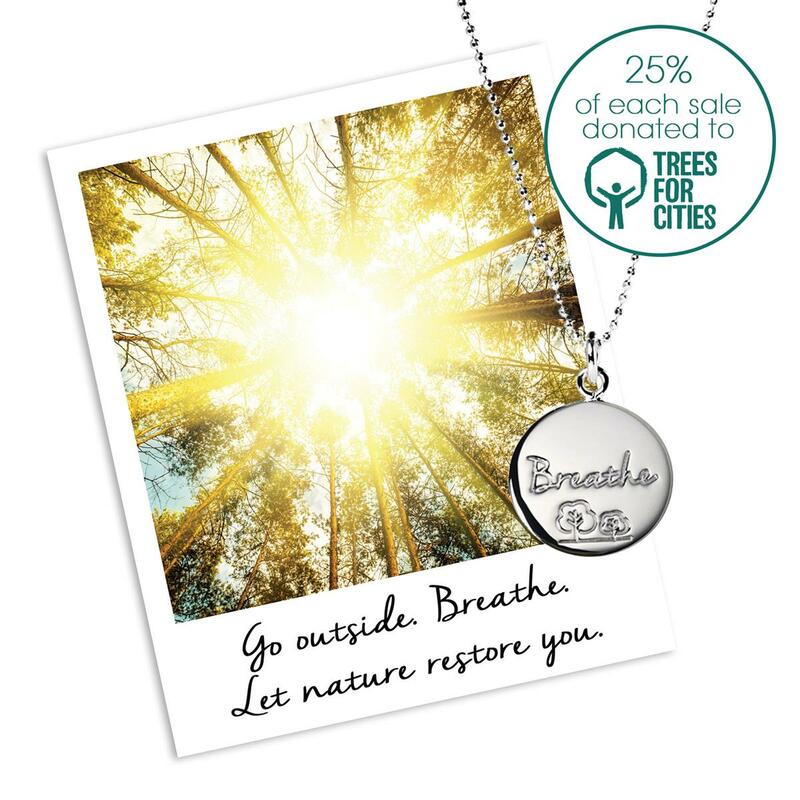 We will be donating 25% of the sales of this necklace to Trees for Cities. Trees for Cities is the only UK charity working at a national and international scale to improve lives by creating greener cities. They get stuck in with dedicated volunteers to cultivate lasting change in neighbourhoods – whether it’s revitalising forgotten spaces, creating healthier environments, or growing food with kids. The reason we love this charity so much is because we are huge believers in the importance and power of trees and green spaces in our urban environments. At Mantra, we are lucky enough to be based in Leamington Spa, a beautiful and very green town in the leafy county of Warwickshire. We appreciate this each and every day, when we go for a walk in lovely Jephson Gardens before work in the morning; sit in the park by the River Leam to have our lunch in the Summer; or walk under a canopy of shady trees as we leave for home at the end of the day. And we know that many people in this country do not have this opportunity, as they are surrounded by concrete and tarmac, in environments full of buildings, busy roads, traffic congestion and lack of natural light. Trees bring tangible benefits to our cities, to our health and to our wellbeing. In London alone, each year, trees remove 2.4 million tonnes of air pollution, including carbon dioxide, dust and other gaseous toxins. And it’s not just about the physical and environmental impact of trees: trees also help us with our ability to cope mentally with life in an artificial urban environment. Eighty percent of us are now living in urban environments, and there is no sign of this slowing down. Being around nature has been proven to reduce our stress and anxiety levels. We need our trees more than ever. Trees for Cities was set up in 1993, and has planted 840,000 trees so far. This year, they have delivered projects in 21 UK cities, engaging more than 4,500 volunteers. We really want people to donate to this charity or volunteer with them, or buy one of our new fund-raising necklaces, to help them carry on with their valuable work. We are working closely with Grace Hussey, Corporate Partnerships Coordinator for Trees for Cities. As Grace said to me,deep breaths, and appreciate the beauty around us. The natural world has such power to calm us, to inspire us, and to connect us to something bigger. The necklace will be priced at £45 in Sterling Silver and £65 in 18ct Yellow and Rose Gold-plated, with 25% of the retail price going to Trees for Cities. It will be blank on the reverse to allow for personalisation, with a name, date or special word or phrase. An inspiring gift for someone who needs a gentle reminder to slow down, breathe more deeply, and take time to appreciate what’s around them; a calming gift for someone who is busy or stressed; or an uplifting reminder to yourself to get outside more often and enjoy the fresh air. Trees for Cities (TfC) is an independent charity (1032154) set up in 1993.